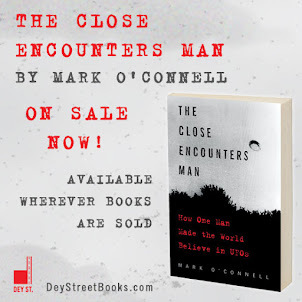 A couple big UFO milestones passed this week, and they bear mentioning. Yesterday, May 1, was the birthday of my man, Dr. J. Allen Hynek. He was born in 1910, when Halley's Comet was passing through the neighborhood. Family lore was that new parents Joseph and Bertha took their 5-day-old son Josef Allen to the roof of their apartment building in Chicago to see the comet in the night sky. This was a risky move in 1910. Halley's Comet was making its closest approach to earth in recorded history, and in fact our planet was going to pass through the tail of the comet as it passed. No one knew what might happen when comet dust pervaded out atmosphere. Would it poison us? Would it blind us? Would it kill us? Or would it turn us all, as H.G. Wells optimistically predicted in his 1906 novel "In the Days of the Comet," into proponents of free love? 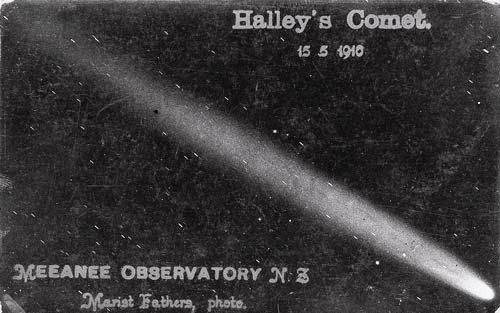 Halley's Comet as it appeared in 1910, moments before obliterating all life on earth. Also, I'm not quite sure on what day this happened, but sometime in the past week High Strangeness topped 100,000 total page views! That's 100K+ in a little under three years. Even if it's not a super huge number in the world of social media, I'm pretty pleased with it. And even if I discount the few hundred page views of my friends, relatives, colleagues and dog, it's still a pretty respectable number. What's fascinating to me is what you, my readers, are most interested in. A post I wrote last year called "UFO Dilemma" has garnered 2,856 page views, the most of any. I was kind of angry and cranky when I wrote that post, so I guess the take-away is that I'll grow my readership dramatically if I write angry, cranky posts all the time. That's doable. 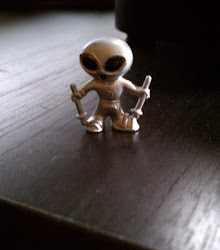 And to help me along in that regard comes the news that my #2 post, coming in at 2,348 page views, is "The *&$&^%$ Atacama Humanoid", which, as you may know, makes me seriously concerned about the entire field of UFOlogy. What is it about that shriveled little carcass that is so fascinating to you people? I'm more annoyed than usual at the Atacama Humanoid, because I just got a notice a few days back from its promoter, Dr. Steven Greer, about a $100,000 "STAR Challenge and Award" that he wants to give out to anyone who can generate 100% clean energy from nothing. Apparently, Greer has raised $100,000 from his fans, which isn't enough for him to open "a professional research and development lab," but is enough for you or me to open such a lab. If I understand the pitch correctly, Greer is willing to pay me $100,000 of his fans' money to come up with a workable "open-source 'free energy' device." Which is great and all, but it seems to me that if I did create such a device I would A) become filthy rich even without Dr. Greer's measly $100 grand; and B) be assassinated by big oil before I had a chance to spend one penny of it. So what do I get out of Greer's deal? Oh yeah... more page views. If someone were to come up with a energy free device and 'maybe' be paid $100k for this information, I wonder what Dr. Greer's cut would be in this matter?? Probably a bit more than $100k?? Hahaha, you are undoubtedly correct!